Poland will block the final statement from EU summit after leaders re-elected Donald Tusk as president despite Warsaw's fierce opposition. BRUSSELS: Poland will block the EU summit's final statement Thursday in protest at the re-election of president Donald Tusk, diplomatic sources said, in a blow to efforts to promote post-Brexit unity. 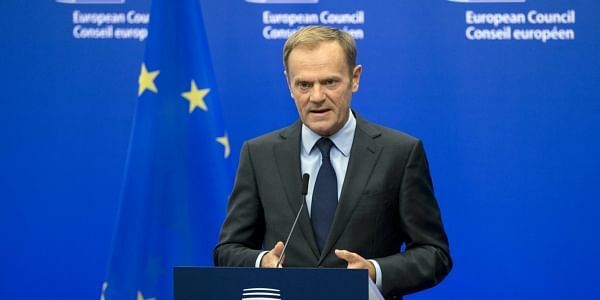 "Poland is now opposing the conclusions" that the 28 European Union leaders were meant to issue after the meeting in Brussels, although it will not affect the vote to give Tusk a second term, one source told AFP. The rare veto comes after Poland's rightwing government accused its EU counterparts of riding roughshod over its opposition to renewing Tusk's mandate. The summit communique, which needs to be agreed unanimously to take effect, was meant to have contained conclusions on EU talks on the economy, migration and instability in the Balkans, as well as Tusk's re-election.